for our New Zealand customers. 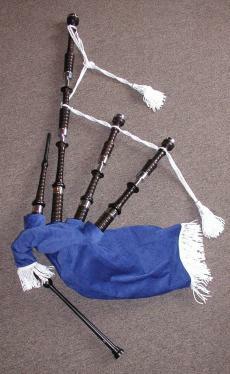 Wallace Bagpipes are available ex-stock. The services of Mitchell's Bagpipe Centre, part of Mitchell Kilt Hire operations, are provided by Bryan Mitchell. Bryan is an active piper with 20+ years experience as a Pipe-Major in local pipe bands. In all, over 45 years piping experience with pipe bands, solo piping and commercial bagpiping. Practical experience and innovation (make it if possible, or convenient, time permitting) combined with a desire to see you get instruments you'll like to play. This drives a passion to help you get the best from bagpiping. As a bagpiper you get service and support from someone experienced, interested and concerned, not just a retail sales person providing a box of bits and pieces. This page is here to inform and indicate the Wallace range of bagpipes and accessories available. 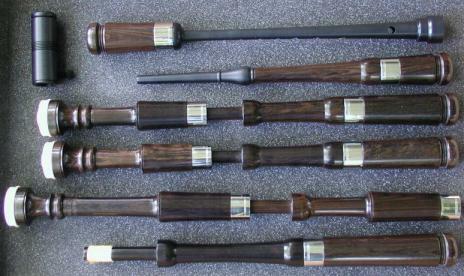 You can visit the Wallace web-site web-site to see the full range of bagpipes and accessories. NZ $Prices are NOT available online on this web-site. Sales are made by personal contact. Call in map (by appointment), phone (07) 827 6906 or e-mail me and we start from there. Payments by plastic are not possible, so this page does not shove you into a "shopping or sales cart" mode. Purchases can be made using cash, personal cheque or direct bank deposit. Select the category for your inquiry by row, and then click on the cell, or simply scroll down the page. Request a Price List - Available ONLY within NZ.